Petra Stavast has brought enormous care and devotion to documenting the life of her former landlady, Ramya. When the photographer moved into Ramya’s home in 2001, the camera became their means of communication. The result is a series of quiet, intimate photographs of the house and its inhabitant. Following Ramya’s death in 2012, the project gained a new dimension. Stavast delved deeper into her former landlady’s life story and discovered not only Ramya’s private archive, but also photographs taken from time to time by a neigbor. 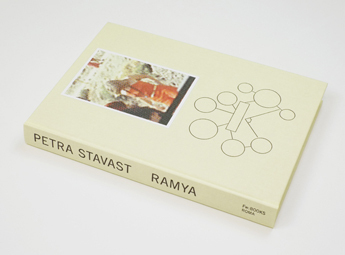 In her committed photo book, Stavast traces events such as Ramya’s membership of the Rajneeshpuram commune, established between 1981 and 1985 by followers of the Bhagwan (Osho) in the no-man’s-land of Oregon, USA. Now, as Stavast’s photographs reveal, the only on-site reminder of that period is a wide asphalted road. A video shows Ramya, back in Amsterdam, at a workshop given by a new guru. Together, these documents constitute Stavast’s biography of ramya: a record of an unusual life.